Far back in 2009, while following Digital Communication, Advertising and Art Direction at NABA (New Academy of Fine Arts of Milan), I became interested in Professor Massimo Banzi's classes and managed to get a Diecimila. 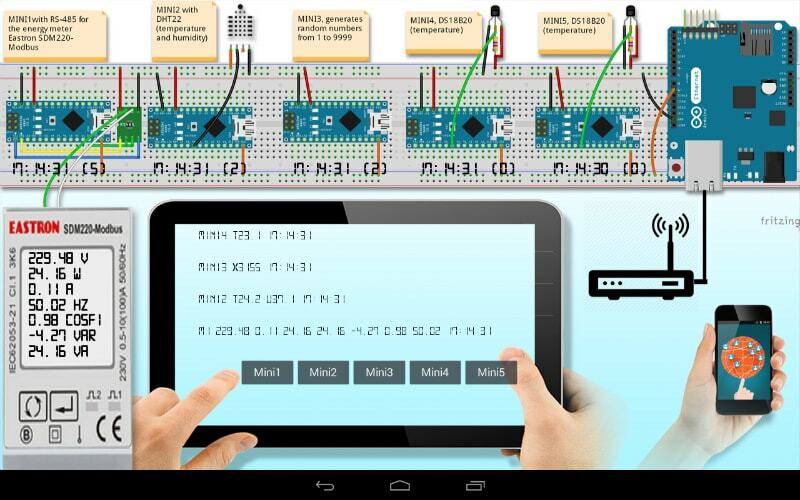 In just one day my vision of the world changed and I slowly started to better understand computers and electronics while sharing results with the Arduino community both on my website and on Arduino's forum. I began building robots and after few years of experiments I have launched my first start­up experience with a webshop of Arduino compatible, CNC machined robot kits, boards and sensors. 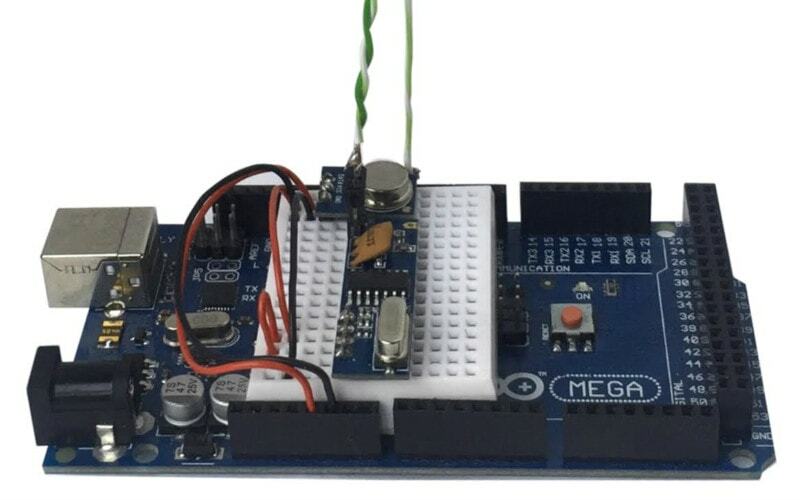 I needed to connect many microcontrollers on a common bus and I was not satisfied by the solutions available at the time so I started developing my own data link. In 2010 I wrote the first implementation of the Padded jittering data link v0.1 which was basic, full of bugs and working by mere chance. After debugging, experiments proved it was working well not only through wires and the human body, but also wirelessly through radio and infrared light. It showed to be robust operating bidirectionally in spite of interference. After noticing that connecting quiescent devices to the bus was not affecting communication between other devices, I started experimenting with an initial collision avoidance phase, a single byte device id supporting 254 (plus BROADCAST) unique ids and a synchronous acknowledge at the end of the packet. It was shocking to see that many devices were able to send and receive data through the same wire. 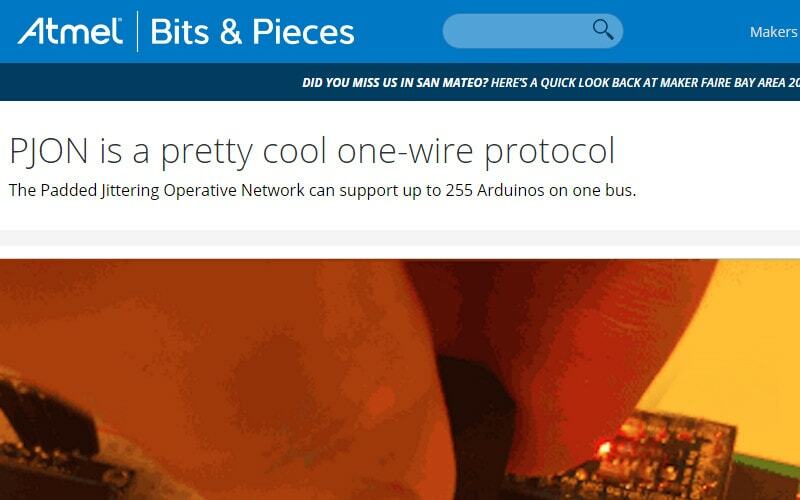 In 2010 I released the PJON protocol specification v0.1 on the Arduino forum, receiving many "don't ­reinvent ­the ­wheel" and few active contributors. With a working protocol layer and support from the community, I went further developing the addressing adding to the 1 byte device id and optional 4 bytes id used to identify a group of up to 255 devices or bus, supporting up to 4.294.967.295 buses and a total of 1.090.921.692.930 devices. This addition released in the PJON protocol specification v0.2 enabled coexistence and networking for groups of devices. Thanks to Micheal Teeuw's post on his blog, PJON received contributions, testing, debugging and feature requests. Many talented contributors ported devices like ESP8266, Teensy 3.2 and Node MCU. With Strategies, PJON had finally a way to communicate data agnostically through many different media and to support more than one PJON instance running in the same program. The curiously recurring template pattern or CRTP was adopted to abstract the physical layer in separate classes called Strategies. Thanks to this change from then it was possible to instantiate a PJON object passing the preferred data-link. Initially, I ported two Strategies, one for wired communication called SoftwareBitBang and one for noisy media (such as radio) called OverSampling. Later on, I developed together with Fred Larsen ThroughSerial able to operate through a serial port. Something that seemed to be just a boy's game appeared on many relevant websites and blogs where many trolls, raging, were wondering who was this italian guy without a PhD from MIT, who tried to approach this problem. 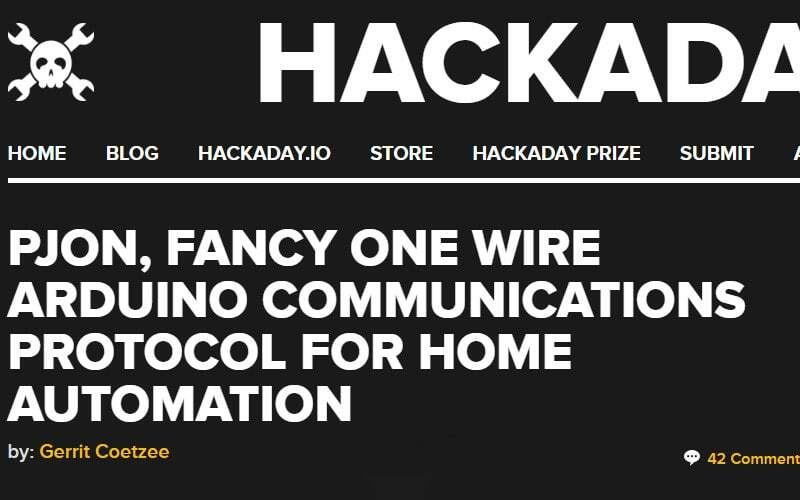 Hackaday and the Atmel blog wrote about the PJON protocol and from that day an ongoing earthquake began. Since then, the PJON protocol layer specification has been used in academic researches and PhDs in different parts of the world, and the official PJON implementation has already been applied globally in a wide range of different systems. The release of the PJON protocol specification v0.3 is the result of the most interesting proposal I have received so far, by Fred Larsen, who is now a great new friend already even if we never met personally. He proposed the addition of a 1 byte header containing information on the packet and the configuration requested by the transmitter. This left a fixed configuration scenario, where interoperability was impossible, and headed to a dynamic network architecture. An entire new set of possibilities opened up and many contributors started to consider how to take advantage of this new entity. EthernetTCP and LocalUDP strategies proposed and developed by Fred Larsen enable multiple devices with Ethernet ports using PJON to communicate with each other on a LAN, WAN or across the Internet. So now you can also create a PJON network of devices using an internet connection. A growing community is providing us with PJON implementations in other programming languages like PJON-python by Zbigniew Zasieczny and PJON-c by Matheus Garbelini, thanks to their work, it is now possible to run PJON on a wider range of devices. At the same time the protocol reached is first stable version with the release of the PJON protocol specification v1.0 which added a lot of new features. Implementing the interfaces abstraction, PJON can run and be cross-compiled on different platforms and architectures simply defining a dedicated set of interfaces to system calls. I have developed the RPI interface to support Raspberry Pi, after few weeks Zbigniew Zasieczny developed the WINX86 interface enabling PJON communication on computers running Windows, and soon after, Fred Larsen developed the LINUX interface enabling PJON communication on computers running Linux. Finally, the same codebase running on ATtiny85 can be executed on a real time operative system supporting full interoperability. Although PJON is licensed "AS IS", the more was applied in the real world, the more I was feeling the responsibility for possible failures. When in 2016 Fred Larsen used PJON and ModuleInterface to handle the life support systems of his hens' house in Norway I started to be preoccupied for those animals and finally aware of the potential consequencies and the risks involved in PJON real world applications, specially if dealing with living beings. 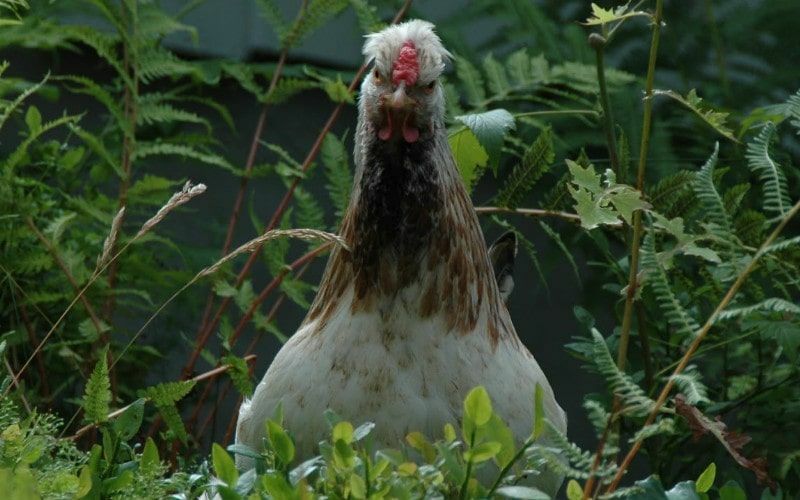 If for whatever reason the temperature value transmitted was corrupted by interference or because of a bug, the hens could have ended up frozen or roasted. The conception of this possibility has pushed me to study deeper the implementation and make better software. The hens are alive and no failures have been recorded.